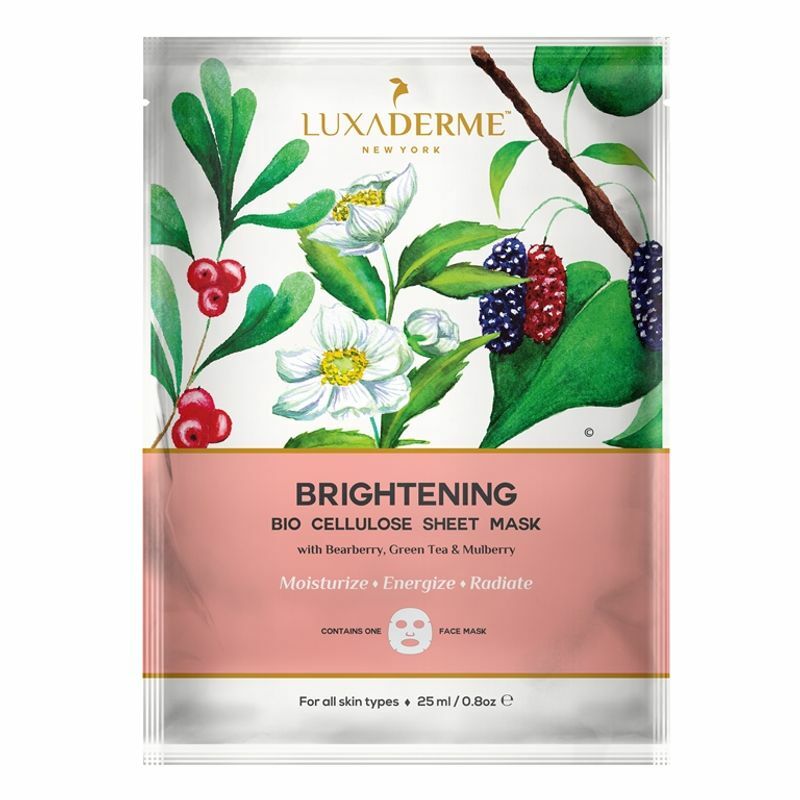 LuxaDerme Brightening (Bio Cellulose) Sheet Mask is an incredible innovation in the field of skin care giving an instant dose of radiance and glow for a healthy looking complexion. This sheet mask is ideal for those who need help in brightening their complexion and addressing uneven skin tone caused by hyperpigmentation and photoaging. These masks are pre-cut to fit your face and are infused with a custom blend of proven skin brightening ingredients. They work together to moisturize and lighten the damaged areas of the skin, making it less visible and giving the skin an even-toned glow. Its 3 dimensional nano-fiber structure clings to your face perfectly like a second skin imparting all its vital nutrients and essence, thereby transforming it into being well hydrated and radiant. It is easy to use, effective, non messy and non sticky. It is free from any chemical and synthetic ingredient that may prove harmful to your skin. They come in durable foil packets and are very travel friendly. Niacinamide: Also known as Vitamin B3, improves skin elasticity and erases discolorations. It revives skin's healthy even tone and texture, keeping it well hydrated and moist. Green Tea: The polyphenols in green tea possess potent antioxidant and skin-soothing properties, and show significant promise for improving the appearance of sun-damaged skin. Arbutin: It is derived from the leaves of bearberry shrubs, blueberry, cranberry and certain types of mushrooms. It is known to inhibit the synthesis of melanin and is therefore used as an active skin brightening agent. Rosa Canina: It is exceptionally high in vitamins and plant sterols which promote tissue regeneration and healing. Explore the entire range of Sheet Masks available on Nykaa. Shop more LuxaDerme products here.You can browse through the complete world of LuxaDerme Sheet Masks .